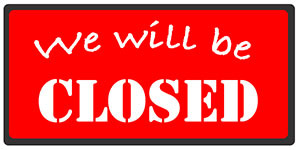 Good Afternoon Patrons & Friends!, The library will be CLOSED this Friday, November 16th, from 1 PM-5 PM for Staff Training. The library will re-open on Saturday, November 17th at our regular hours of 9 AM-Noon. Thank you for your co-operation and patience!